This post was originally posted on Eco-Libris blog on August 17. 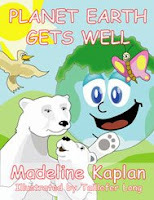 Today we have the pleasure to interview Madeline Kaplan, author of Planet Earth Gets Well‘. This book is Madeline Kaplan’s first children’s book, and as we collaborate with her to plant trees for copies sold at the book signing events and at other promotional sales, I wanted to learn more about the book and what led her to publish a green-themed book for children. Firstly, here’s a little bit background (and a photo): Madeline Kaplan holds a B.A. in English literature and an M.B.A from Baruch College. She has published various business articles, but her three grandchildren inspired the writing of Planet Earth Gets Well, her first children’s book. She lives with her husband in New York and Connecticut. What brought you to write Planet Earth Gets Well? Becoming a grandparent was a transitional moment for me. When I realized that I would be leaving the planet to my precious grandchildren I thought that I must do something that would hopefully have a lasting effect beyond my own lifetime. My grandchildren love me to read stories to them and it occurred to me that the overwhelming problem of global warming would not be solved in my generation. For that reason, I decided to write a children’s book that would introduce the topic in a child-friendly concept and make my personal concern a more public one. Can you tell us a little bit about the writing process? The writing process was easy because it was a subject that I was passionate about. I pretended that I was talking to my young grandson and used words that I knew he would be able to connect with. The character of “Planet Earth” evolved easily. I wanted him to be my grandson’s playmate and by definition other children’s playmate so I was readily able to imagine his “being” and “personality”. Once that was accomplished, the actually writing process went quite smoothly. Your story is very optimistic, with a positive message and a belief in the possibility to change things and make them better – are you also optimistic when it comes to fighting climate change? I wanted the story to be optimistic because I certainly did not want to scare my young audience! Children learn that if they get sick or injured they will get better and that was the message I wanted to convey with “Planet Earth”. I simply could not fathom being pessimistic. Earth’s “Mother” had to be as all knowing as the readers’ mothers! A child’s belief requires nothing but a happy ending! I am encouraged by the growing number of web sites that encourage children to be eco-warriers and eco-aware. I wanted Planet Earth Gets Well to add to this growing awareness that it is never too soon for parents to begin asking their kids to preserve their natural environment. As most of us see and call Planet Earth’ Mother’, I found it very interesting that you make it a baby in the story that has its own mother. How does this idea go with children? do they find it easy to imagine Earth as a baby? Actually, Planet Earth is not a baby — rather he is the age of the reader — between 4 and 8. That is because he is starting to be aware of the word around him, he is interacting with children his own age, he is learning right from wrong yet he must still obey his parents. He wants to be healthy so that he can play with his friends and he is smart enough to understand that there are certain things he must do (and tell his friends to do) to allow this to happen. Planet Earth’s age is one that resonates with readers of the story. It is also an age when kids begin to learn about their natural environment. So the story dovetails nicely with what they are learning in school. What the responses you get already from children? Do they get the message behind this tale? Children become exacted with Planet Earth’s plight and immediately engage in a dialogue about ways in which they might be able to help. They offer instant suggestions in readings and I am delighted with their enthusiasm. They draw pictures of Planet Earth, the Sun, the Trees, the Oceans and have presented me with those pictures as a gift. Their illustrations tell a story and lead me to believe that I’ve struck a chord. I’ve been offered tissues, allergy medicine and a host of other things to help planet earth get well and it has warmed my heart. I have been asked to read the story repeatedly which tells me that although this may be a new concept for kids, they are interested enough to want to understand it more deeply. Their concern for Planet Earth is real. Do you think the story can impact parents as well? When parents see how their kids respond and how much it inspires them to care about the earth, how can parents not respond? And when they continue the dialogue with their kids after they have finished the story they become even more engaged in the thought process about the implications for not taking care of the environment. The book gives kids ideas about what they can do to protect the earth and their activism is contagious. What other educational measures should be taken in your opinion to educate children on the importance of living green and conserving our resources? The best way to educate is by example – everyone should try to ” walk the green walk ” in whatever way they can. As in other behavioral areas, parents who model for their children encourage them and habits become second nature (no pun intended!). If we want our children to live green lives, then we must lead by example. Thomas Friedman wrote in the NYT lately that “Our kids are going to be so angry with us one day. We’ve charged their future on our Visa cards. We’ve added so many greenhouse gases to the atmosphere, for our generation’s growth, that our kids are likely going to spend a good part of their adulthood, maybe all of it, just dealing with the climate implications of our profligacy. ” What’s your comment on that? Is their any way we can convince the parents’ and the grandparents’ generation that Planet Earth is sick? The fact that is starting to hit so close to home and people of our generation are feeling the effects of our actions right in our own backyards. That is precisely why I wanted to target a younger audience. New habits must become ingrained at an early age. Our generation is late to the party. Thankfully, green awareness is in the news more and more, companies are beginning to go green and so working parents are hearing more about environmental issues and they want to pass it on to their children. Do you have plans for writing more children’s books? Will they be with environmental messages as well? My key focus right now is to create more awareness for the book so that more kids and their parents can benefit from the learning. Since there is so little on the market for kids from age 4-8, I want them to be able to receive this very important message in a concept targeted specifically to them. I am also looking at partnering with various environmental organizations by donating books so that they can use the story as part of their educational curriculum. I want to do all I can to help these organizations get this big message out to the little ones. Anything else you would like to share with Eco-Libris blog readers? I am honored to be able to team with Eco-Libris. I believe strongly in its mission and welcome our collaboration. Planet Earth Gets Well is currently being sold on http://www.amazon.com/. The book has received some great endorsements from major green sites like http://www.treehugger.com/, which compared the book to Dr. Seuss’ The Lorax. This was very gratifying indeed.